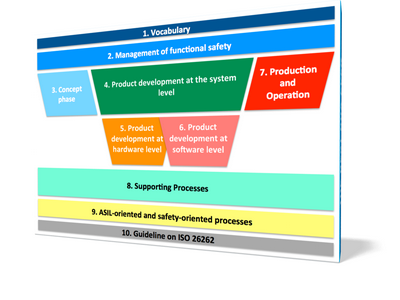 The overall goal of almost all supported projects – under the icomod label and in former assignments – was and is to improve the efficiency of the system engineering process. Achieved by more clarity, more modularity, more reusability. An integral concept of the solution is the simultaneous consideration of local faults and their global failure effects during the whole product development cycle. Continuous evaluation in both directions, inductively and deductively, means: dependability analysis in 360-degree-view! However, analysis alone is not all, especially if new tools, technologies and processes are involved. In previous employments as well as in the role as independent service provider our team also performed many hours of method training, consultancy and coaching – offsite and onsite, always listening to the customer and often challenging what we heard – to really get to the bottom of the case and eventually open doors to new solutions. The projects covered all phases of the product development process, from initial requirements caption, over pre-development, architecture optimization, dimensioning, partitioning, integration, test data validation down to after-sales tasks like monitoring and troubleshooting. For an overview please check the separate pages for industrial projects and academic projects.